I've made this recipe before, granted it's been a couple of years. In fact I believe I was pregnant with the Farming Tot when I made this recipe last, ah the memories! There is something very special to me about eating a delicious bite of turkey with a little dollop of cranberry sauce on top... Yum! Now I have absolutely nothing against canned sauce, but it's SO easy to make homemade sauce that I just don't even see the point in not making it anymore. What's absolutely wonderful about this sauce is that you can make it days ahead of time and keep it in the fridge until your holiday meal, which for me is a lifesaver when you have a lot to cook and bake (and if you find yourself forgetting to buy ingredients so you are running behind... Yes I am guilty of that this year!!). Oh and did I mention it also freezes well so you can keep the leftovers to use for other recipes throughout the year! Happy cooking and Baking this Christmas Season! In a medium sauce pan, combine all the ingredients minus the cranberries. Heat over medium heat until sugar is completely dissolved. Once dissolved add in the bag of cranberries. Stir and heat until boiling. 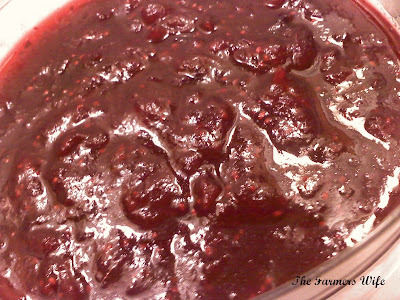 Cover and simmer for about 15 minutes, stirring occasionally, til the berries have popped and the mixture is thick. Take off the heat and let cool, the sauce will continue to thicken as it cools. At this point you can either can it, put it in an airtight container in the fridge or serve. This is a family favorite, not only do we love cranberry sauce but the added hint of spice just gives it a wonderful festive flavor. It wonderful on my favorite holiday leftover sandwich, a roll, with a little sauce, turkey and stuffing... Yum! 4 stars.